West Elm hits New England September 1st! With their first retail store opening in Burlington, MA (15 minutes north of Boston) in the new lifestyle center, Wayside Commons, located at 6 Wayside Road in Burlington (exit 33A on Rte. 128/I-95). Wayside Commons will feature an array of stores and restaurants in an open air village atmosphere, including an additional new-to-the-area furniture store, Arhaus Furniture, along with local favorite, Domain. West Elm is soon to open a Boston store (downtown) in late September, details to be announced soon right here at decor8. 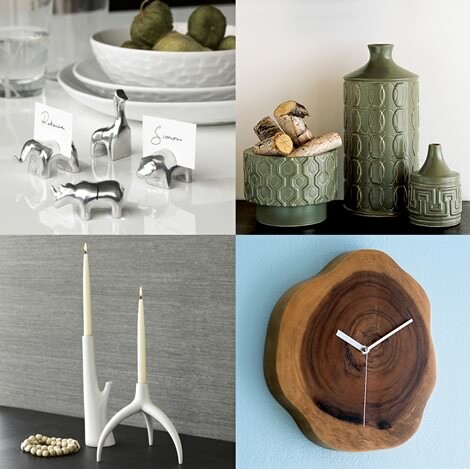 Did you see the animal placecard holders, modernist vases, branch candle holders and the wood plinth clock? I can't wait until I can actually see all of this stuff in person soon, I shop West Elm online without seeing the goods in person first, so this will be a great treat - not to mention, save shipping fees!